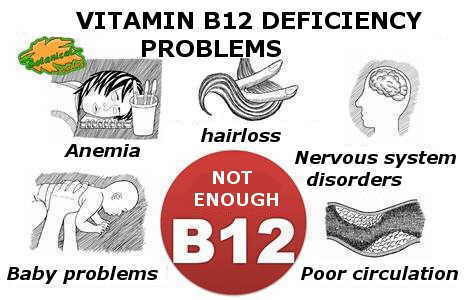 1.1 WHAT ARE THE SYMPTOMS OF B12 DEFICIENCY? 1.6 When vegetarian have B12 deficits? Initially it was considered that the only function of vitamin B12 was the correct formation of red blood cells and avoid anemia. It is now known that vitamin B12 in many other vital functions: This vitamin is necessary so that the myelin sheaths of the neurons are renewed. It also acts, along with folic acid (vitamin B9), in the proper functioning of the cardiovascular system. Does an egg-lacto-vegetarian diet provide enough B12? – Megaloblastic anemia: Since blood cells have a short life, red blood cells and hematocrit are the parameters most affected by B12 deficiency. For this reason it is explained that vitamin B12 deficiency produces megaloblastic anemia and low hematocrit. Anemia can also occur due to lack of protein in the diet, due to lack of iron or folic acid (vitamin B9). As symptoms that may indicate anemia: Tiredness, pallor, hair loss, fatigue, tingling in the extremities, amenorrhea, etc. – Problems in the immune system: The immune system can not form correctly due to B12 deficiency. People with B12 deficiency may be more prone to infections. – Problems of the nervous system: The lack of B12 produces neurological symptoms that affect the cognitive capacity and / or the muscular sensitivity. This is the differential characteristic of B12 deficiency and may manifest as tingling in the hands or feet, loss of reflexes, lack of concentration, etc. – Coagulation problems: When vitamin B12 deficiency is severe, thrombocytopenia and hematoma (ecchymosis) occur in the legs and buttocks. 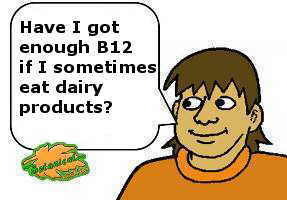 This is seen in babies with B12 deficiency by vegetarian mothers (who are not supplemented). B12 missing consequence summary sheet. Deficiency in this vitamin has serious complications such as anemia. In newborns and children the lack of B12 can have serious consequences, mainly due to the high level of growth and development that they present in these vital stages. Possible neurological sequelae may occur. When vegetarian have B12 deficits? It is estimated that all vegetarians have vitamin B12 deficiency at most from the age of 4 on a vegetarian diet. You may have it earlier if your vitamin requirements are high or if you have absorption problems, such as intestinal and old people diseases (decreased absorption), infants of lactating vegetarian mothers, vegetarian children or pregnant women. Many times, vitamin B12 deficiency may have no clear symptoms. An adult vegetarian has some B12 store, which he has accumulated throughout his life. However, when subjected to a specific analytical (erythrocytes, hematocrit, vitamin B12 and levels of methylmalonic acid), usually deficiency values ​​of this vitamin appear. – A healthy diet is the best way to avoid a lack of vitamin B12 or cobalamin. – Supplement vegetarian diets: Ingestion of vitamin B12 supplements may be necessary in special circumstances when diet may not meet individual needs. – Supplement pregnant women who consume few foods of animal origin, even if they are not strictly vegetarian. Taking too few dairy products, eggs or meats may be insufficient to meet the needs of pregnancy (to be assessed by the doctor or dietitian). – Care in vegetarian babies and children: Vitamin B12 is very important for them, not only to improve circulation and prevent anemia, but also involved in the multiplication of cells (huge for the growth of the fetus, baby, Children and young people), and in the formation of the nervous system. – Does the body store vitamin b12?